This paper proposes a combined mechanism for coordinating agents in timed normative multi-agent systems. Timing constraints in a multi-agent system make it possible to force action execution to happen before certain time invariants are violated. In such multiagent systems we achieve coordination at two orthogonal levels with respect to states and actions. On the one hand, the behaviour of individual agents is regulated by means of social and organisational inspired concepts like norms and sanctions. 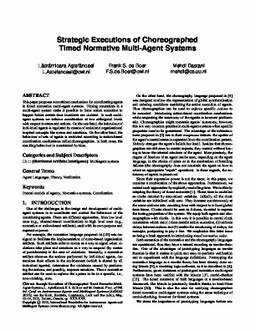 On the other hand, the behaviour of sets of agents is restricted according to action-based coordination mechanisms called choreographies. In both cases, the resulting behaviour is constrained by time. Astefanoaei, L, de Boer, F.S, & Dastani, M. (2010). Strategic Executions of Choreographed Timed Normative Multi-Agent Systems. In W van der Hoek, G.A Kaminka, M Luck, & S Sen (Eds. ), Proceedings of Autonomous Agents and MultiAgent Systems 2010. ACM.